Japanese Autumn is beautiful and charming in its own way. The tasty food in autumn is just as bountiful and as the colorful autumn leaves. We introduce some of the seasonal food you shouldn't miss if you are planning to travel to Japan in Autumn. The days grow cooler in Japan and the foliage turns to red. With the temperatures dropping, the arrival of autumn is something to be celebrated. Autumn is Japan’s traditional season of food and dining. The fall harvest is the best time to enjoy an abundant selection of Japanese ingredients at their peak. One can enjoy seasonal fish, chestnuts and fruits, all offering sweet fall flavors! Are you ready for autumn's delicious food? Let us introduce you to ten of the most popular autumn foods in Japan. Oden is a Japanese autumn favorite as lunch or a quick dinner. The base is a mild, soy-flavored dashi soup. One can choose their favorite ingredients from options such as boiled eggs, daikon (Japanese radish), fish cakes, cabbage rolls or meat-and-mochi-stuffed tofu skin. There are also plenty of healthier additions such as seaweed or konnyaku (a low-calorie firm jelly made from the konnyaku potato). You can buy the ingredients from a supermarket and make oden at home or just buy it at most convenience stores. Sake is one of the true tastes of Japan. Hiyaoroshi and Akiagari sake are seasonal specialties brewed in winter, pasteurized and aged during spring and summer and ready for consumption just in time for autumn. If you are in Japan during autumn, you should definitely give Hiyaoroshi and Akiagari sake a try! The "akiagari" generally means the most recent batch of sake, released that autumn. "Hiyaoroshi" comes from the Edo period and means as much as "cold sake wholesale". In the Edo period sake had to be reheated before shipping it out in summer to avoid spoiling, in autumn sake didn't have to be reheated anymore and so it became known as hiyaoroshi. Hiyaoroshi comes in non-pasteurised, single- and double-pasteurized versions. It is known to have a youthful and vibrant flavor. The first harvest of rice in autumn is called shinmai or new rice. It is considered to have a completely different taste than the rice harvested year-round. New rice is said to be softer and sweeter than older rice. It can only be tried from September to December. Shinmai is processed and packaged for sale in the same year it was harvested and no longer sold after December. You can enjoy a bowl on its own to savor the natural sweetness or you can add chestnuts or matsutake mushrooms to the rice which adds subtle but hearty flavors. Pacific saury is known as "sanma" in Japan. Its peak season is in fall. This silver-skinned fish has a rich flavor and is best enjoyed grilled with a little salt. This popular autumn dish is called sanma no shioyaki (sanma grilled with salt). It offers a high content of healthy fish oil and vitamins. It is always served whole. We recommended eating it starting from the crispy skin and adding a squirt of lime juice, daikon(Japanese radish) or soy sauce to the flesh to bring out its natural flavors. Accompanied by a bowl of new rice and miso soup, it creates a perfect food to satisfy one’s appetite and senses. Persimmons, also known as kaki, are abundant in the Japanese autumn. They are sweet, soft and look a little bit like tomatoes. They are best eaten raw but also often made into jam due to their jelly-like texture. There are two primary types of persimmon, the hachiya (astringent) and fuyu (non-astringent). The Hachiya are very tart until completely ripe and fuyu can be eaten firm like an apple. In Japan, you are most likely to come across the hachiya which become very soft and sweet as they ripen. Nashi, or asian pear, is another popular Japanese fruit during autumn. "Kosui" is a type of nashi which is found in most places in Japan. It has low acidity and a high sugar content making it very sweet. The other major type of Japanese nashi is the "hosui". It is similar to the kosui in taste and texture but it is slightly bigger and it can be stored for a longer time. Kuri, or Japanese chestnuts, are a popular autumn flavor. They can be roasted as a snack (yaki-kuri) or cooked together with rice (kurigohan). Chestnuts are also used in a number of traditional Japanese sweets. Candied chestnuts, known as kuri kinton, are a simple sweet treat in which chestnuts are steamed, mashed and combined with sugar. Yakiimo are simply roasted sweet potatoes, and they are quite possibly the most popular autumn snack in Japan. The sweet potatoes are roasted and sold in a variety of places from conveniences stores over sweet potato specialty shops to food stalls at festivals. You can find many different variations and flavors all over Japan. The mainland serves sweet potatoes with red skin and yellow flesh while the murasaki imo, or purple sweet potato, is especially famous in Okinawa. Kabocha is often referred to as a Japanese pumpkin and is a type of winter squash. It has tough green skin and orange flesh. The skin softens when boiled and is edible.Cooked kabocha has a fluffy texture, and a sweet and nutty flavor. Although available year-round, kabocha tastes best in autumn. It can be prepared in number of ways, from deep fried tempura over braised in soy sauce and dashi broth or simply boiled in water. Japan is home to a rich variety of native mushrooms which are an important part of Japanese autumn dishes. The matsutake mushroom is especially present only in autumn. Matsutake mushrooms are very popular and a variety of dishes are prepared using them. Matsutake are mainly found on the roots of pine trees in autumn and have rich, earthy flavor. As they require very specific conditions to grow, Matsutake mushrooms are renowned for their incredible taste. They can be enjoyed grilled, steamed with rice or cooked in a delicate egg custard. 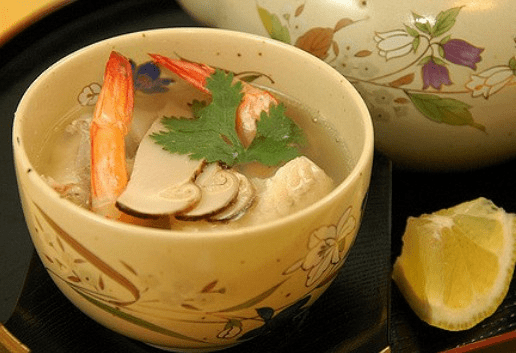 Let us show you a very simple and tasty Japanese soup recipe with matsutake mushroom. Autumn often smells of a hearty mushroom soup called matsutake dobin mushi. This dish is served in a clay teapot called a dobin. It is enjoyed by pouring out the broth into a small cup and picking vegetables from the pot with chopsticks while drinking the soup. The soup consists of a bonito stock, seasonal vegetables, slices of chicken or shrimp, and the aromatic pine mushrooms called matsutake, which contributes a unique smoky flavor. 1. Make the dashi: Place the kelp into a pot with the water. Let it soak for ten minutes. Turn the heat on low. When the water starts boiling, remove the kelp, add in the bonito flakes, stir and turn off the heat. Let sit until bonito flakes sink to the bottom. Strain and keep the dashi stock. 2. Clean the Matsutake mushrooms and scrape the thin outer layer. Pour the dashi into your teapot or dobin mushi pot (if you have one), add all the remaining ingredients. 3. Prepare your steamer and cover. If you don't have a steamer you can also place the pot on a grill over heat or over a rack in a pot with boiling water. Steam for 7 minutes on medium-low heat. Serve immediately. Autumn is a beautiful time in Japan with its red, orange and yellow leaves, clear skies and cool weather. It is also a time to savour many delicious Japanese autumn food varieties. Make the most of your visit to Japan by honoring the tradition of seasonal eating, and enjoy Japanese cuisine at its best! Roasted Sweet Potato Shop Fuji - Choose Between 8 Different Flavors!